Louisiana, Private Disaster Relief Outperforms Government, at valuewalk.com. People with privately owned boats calling themselves the Cajun Navy rescued people from the recent flooding in Baton Rouge. They used phone apps and Facebook to find people needing help. What was Louisiana’s State government response? Louisiana Lawmaker Wants To Subject The Cajun Navy To Government Red Tape, Regulations, And Fees, at carpediemblog. Does this surprise anyone? Although the State Senator clarified his original statement, we all know that government intervention starts with good intentions and ends up with bad consequences. How did the Federal Government respond to the crisis? 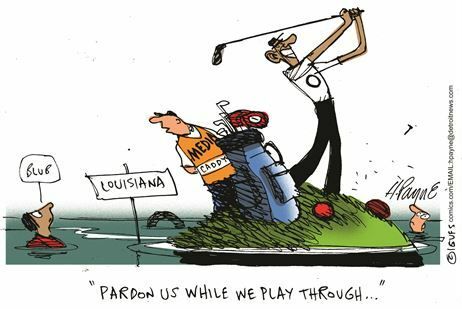 The Obama Administration Gives Louisiana Flood Victims An Anti-Discrimination Lecture, at thehayride.com. The Justice Departments guidance “highlights the importance of complying with nondiscrimination requirements of civil rights statutes, addressing the needs of the whole community, and ensuring equal opportunity to access recovery efforts..” This kind of nonsense is more important to bureaucrats than actually doing the hard work of helping with the recovery. Hey! Here’s the best policy for Government. Get out-of-the-way. Quit making it harder for the people who are actually getting something done. Massachusetts To Tax Ride-Sharing Apps, Give The Money To Taxis, at reuters.com. This is an example of government officials trying to overturn the decisions made freely by millions of consumers in the market. Bureaucrats only like free market results when these results agree with what the bureaucrats think the results should be. Massachusetts is going to levy a 20 cents tax on each ride given by Uber Lyft and other ride-sharing apps. 5 cents will go to the taxi industry as a subsidy. Excerpt from the article: “The law says the money will help taxi businesses to adopt “New technologies and advanced service, safety and operational capabilities” and to support workforce development.” In order to compete with the new ride-sharing technology, wouldn’t you think the taxi industry should have been doing this already? Is the taxi cartel like the post office? With Uber and Lyft playing the role of FedEx and UPS. If they can’t compete without taxpayer-funded subsidies, either get better or go out of business. To all the young people who think socialism is a great idea. What do you think of this socialist central planning scheme? Clinton Foundation To Restrict Foreign Donations If Hillary Gets Elected, at washingtonpost.com. 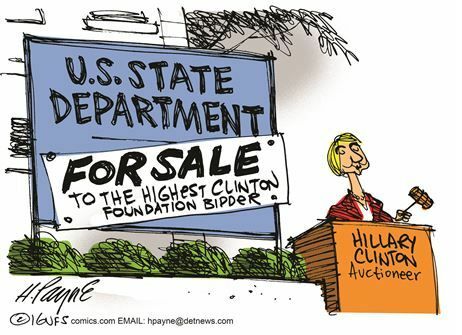 Why would it be bad to accept foreign money if you’re the President, but fine to accept it when you’re the Secretary of State? This is like closing the barn door after the horse has gotten out. Since the Clinton Foundation is a money laundering operation, don’t you think the foundation will find ways to launder this foreign money even if Hillary wins? I Thought Charities Were Supposed To Give, at theburningplatform.com. The Clinton Foundation takes in $177 million of which $135 million is cash contributions. They give out a little over $5 million in grants, assistance, and gifts. That’s 2.9% of what they take in. Look at all the other expenses. Whose pockets are getting lined with the rest of the money? FBI Admits Clinton Used Software Designed To Prevent Recovery And Hide Traces Of Deleted EMails, at zerohedge.com. FBI says Clinton used BleachBit to erase the emails on her private server. From the article: “BleachBit (click here) is software designed to help the user delete files in a way to ‘prevent recovery’ and ‘hide traces of files deleted’.” Remember, she just wanted to get rid of yoga classes and wedding plans. Rigged: Virginia Governor And Clinton Crony Terry McAuliffe, Restores Voting Rights To 13,000 Felons, at tammybruce.com. McAuliffe originally tried to restore voting rights to over 200,000 felons. This attempt was shot down last month by the state supreme court. But like the Terminator he is back. Do you think that McAuliffe would be this persistent in his efforts to “right a perceived wrong” if this bloc of voters voted for Republicans? Top 25 Corporate Pension Plans Alone Are Underfunded By Over $225 Billion, at zerohedge.com. Add this to the insolvency of social security and you tell me; who is going to pay for the over consumption of the last 15 years that was caused by money printing? That’s right the people who produced real value during that time period. State University Now Offers ‘Stop White People’ Training, at zerohedge.com. Excerpt from the article: “They state their purpose is to “help others take the next step in understanding diversity, privilege, and the society we function within,” Presumably the “white” society they plan to “stop” at the event.” No comment necessary! Heroic University Of Chicago To Incoming Students: We Do Not Support Safe Spaces And Trigger Warnings, at targetliberty.com. Excerpt from the article: “Our commitment to academic freedom means that we do not support so-called ‘trigger warnings,’ we do not cancel invited speakers because their topics might prove controversial, and we do not condone the creation of intellectual ‘safe spaces’ where individuals can retreat from ideas and perspectives at odds with their own.” At last some sanity in this world! Do you think the University found courage because alumni said they would not donate anymore if the university went down the trigger warning road? I’m just asking. I don’t know. Obama Energy Secretary: Fracking Is Good For The Environment, by Bre Payton, at thefederalist.com. The crazy environmentalists have to be going out of their minds over this. Natural gas from fracking is replacing coal in the production of electricity. ‘Greenhouse gas emissions’ have been reduced by 20%. Environmentalists should be thrilled. The free market is reducing CO2 levels. Here is their conundrum. They hate fossil fuels and free markets but they love lower CO2 levels. If their green energy policies can’t get credit for the drop in CO2 emission, they would prefer not talking about the emissions dropping at all. As Predicted Obamacare Is Killing The Middle Class, at zerohedge.com. Remember what we said last week. Obamacare is working exactly as planned. It was supposed to fail. 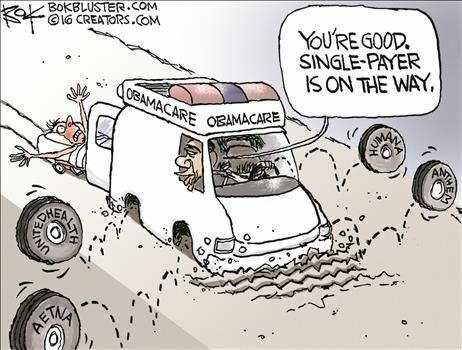 It was intended to be the next step toward a government run single payer healthcare system. This entry was posted on August 26, 2016 at 11:47 pm and is filed under Must Reads For The Week. You can subscribe via RSS 2.0 feed to this post's comments.